Demonstrating Pierre Bonnard’s status as an eminent colourist, ‘Bust in profile, red background’ is an experience of entangled seduction and harmony. 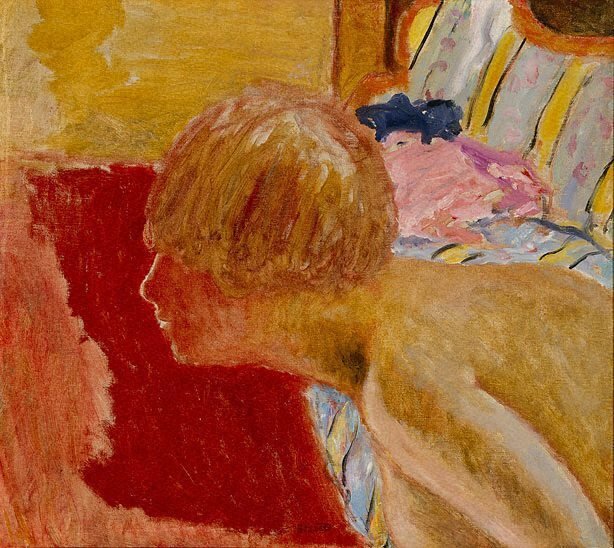 Pictured either naked or bathing, the theme as in many of Bonnard’s paintings is his beloved wife Marthe, who is the catalyst for his studies on form and colour. With her neck fully elongated and her head curiously tilted to one side, Marthe bends down in an uncontrived manner with little consciousness of her husband nearby. Although the scene is a domestic one, Marthe’s unusual profile coupled with the earthy ochres and deep ambers evoke the tribal and animalistic elements of the body and intimacy.